After I announced that Clarkesworld was no longer eligible for the Best Semiprozine Hugo, someone emailed me to find out who I’d like to see replace us on the ballot. At first, I thought I’d just direct them to the Semiprozine Directory and relax a bit, but while looking over the list I realized that I had strong feelings about wanting a foreign market, particularly Interzone, making the cut this year. Since it’s a UK publication, it’s always been a bit of a challenge to get their nice full-color print editions here, but they do have ebook editions for sale on Weightless Books and Amazon. Weightless even has PDFs for people who don’t like traditional ebooks. 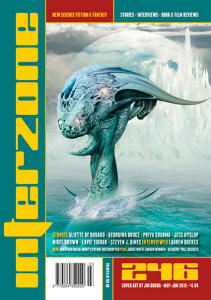 You can also order print copies direct from TTA Press on the Interzone website. Interzone has been nominated for Best Semiprozine over twenty-five times and won in 1995. The current editor, Andy Cox, has yet to win. This year, they have a good chance of being nominees. With Worldcon in London, it stands to reason that more attendees than normal will be familiar and fond of their work. Check them out and decide for yourself. If it’s not to your taste, check out some of the other magazines from outside the US (Albedo One, Andromeda Spaceways, Aurealis, Black Static, Neo-Opsis, On-Spec, etc.) and see if one of them would be a good fit. It’s past time to put some more of the world into this aspect of Worldcon.